12 February 2010, at 9:07a.m. US - On show at the International Poultry Expo 2010, the YieldPlus debone/trum managememnt system improves poultry yield, throughput and quality, says Gainco. The YieldPlusTM Debone/Trim Management System from Gainco helps poultry processors get 'more out of their meat' and deliver additional profits to the bottom line. Poultry processors can significantly reduce their labor requirements in dark meat deboning and breast trimming operations, while also achieving measurable improvements in portion control consistency, product yields, throughput and quality. For example, with the YieldPlus system, users typically can achieve up to three per cent or more in improved boneless dark meat yields, giving them a very rapid return on their investment. YieldPlus brings together advanced product distribution and data collection systems from Gainco with the yield improving and labour-saving technologies of Bettcher Industries' Whizard® Series II Trimmers. Incoming product is automatically weighed and distributed to each operator for further processing (dark meat deboning, fillets, tenders or nuggets) and tracked by individual operator station, thereby allowing poultry processors to hold their employees accountable for individual performance in the areas of yield, portion control consistency, quality and productivity. Robust and precision system controls mean that batch integrity and proper operator accountability is maintained throughout the entire process, with results posted for each workstation in real time. The YieldPlus system allows for maximum flexibility as well as consistency in processing products to varying specs (e.g., size, shape and weight), while the user-friendly interface makes pre-programming of orders and QC activities easier than ever. The advanced software design of the incorporated QC stations allows for specific defect tracking via a touchscreen interface that is configurable for each customer's needs. QC operators can track any specific incidences of defects to an individual operator station with the simple touch of pictorial icons on the QC station interface. With the YieldPlus system in place on the processing floor, meat quality is improved through the ability of supervisors to identify and eliminate problem areas in the process (or operators) quickly and easily – thereby eliminating the incidence of bone fragments, cartilage or other product defects. For breast trimming and portioning applications, the YieldPlus system can incorporate Gainco's rugged DuraWeigh® bench scales featuring IP69K-rated Gainco Infiniti® weight indicators for the ultimate in protection from harsh chemical washdowns, water ingress and condensation. The system's ingenious open-frame construction eliminates water puddling and guards against corrosion and the buildup of bacteria, thereby enhancing food product safety. In addition to its precision-weighing capabilities, the YieldPlus system delivers information reports and summaries instantly, including highly valuable comparative reporting per operator station – perfect for operator supervision, training and incentive pay programs. Data generation has never been faster or easier, and all data can be archived for historical tracking and analysis. The system is also network-interface capable for remote access and monitoring by plant management. The modular design of the YieldPlus Debone/Trim Management System allows Gainco to meet the individual needs of different processors. For example, the system can be constructed with single or dual-sided operator stations – all the way up to 28 operator stations per system. For more information on the YieldPlus Debone/Trim Management System, including viewing short video clips of key system operations, visit the special web site [click here, or contact Brian Porter at (800) 467-2828. 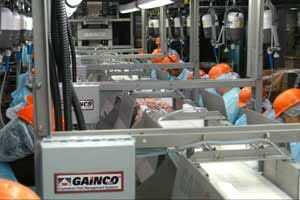 The YieldPlus debone/trim management system from Gainco, Inc. helps poultry processors achieve improvements in product yields, throughput and quality, while also enabling them to monitor the real-time performance of individual operators for QC and training purposes.